Myth: Cancer is a fatal disease with no chance of cure. 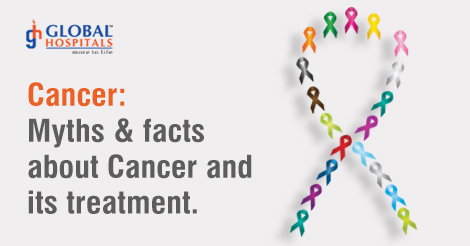 Fact: Cancer is a treatable disease. If diagnosed early, most types of cancer can be completely cured. Even in advanced stage cancer, much can be done to alleviate symptoms and prolong survival. It is a chronic disease like Bronchial Asthma or Diabetes which are also not curable. Myth: Most cancers are hereditary. Myth: Only people with a high risk of cancer need to get cancer screening. Myth: Chewing tobacco, snuff is a safe alternative to cigarettes. Fact: There is nothing healthy about snuff and chewing tobacco. They are just as addictive as cigarettes and can cause cancers of the throat and mouth. Myth: If I have smoked for some years, the damage is already done, so quitting is not beneficial.Fact: No, it is never too late to quit smoking. There will be improvement in the lung function and blood flow after smoking is quit. The risk of lung cancer also starts decreasing once smoking is quit. By 10 years it reduces to 50%. Myth: If there is no case of breast cancer in my family I need worry about it afflicting me. Fact: This is by far the biggest cancer myth of all. Men do get breast cancer though uncommon. Myth: Chemotherapy drugs usually cause death and avoiding these drugs is a better option when they are needed. Fact: Selection of Chemotherapeutic drugs and their dosage is done by experts looking at the diagnosis and general condition of the patient. Rarely complications do occur. But risks should be weighed against benefits. Better talk to your doctor before denying the chance of cure. Myth: Radiotherapy means giving electric shock and it burns the skin and internal organs. Fact: Radiotherapy is using high energy X rays and with the latest technologies no such toxicities occur. Myth: Patient receiving radiotherapy is harmful to his family members and Children. Fact: A person is totally safe after he comes out of Radiotherapy treatment room and donot harbor any radiation. Fact: Radiotherapy causes hair fall in the area that is treated not generalized as with chemotherapy.